Here is a good chart from Morris 4x4 Center. I have purchased several items from them. Hey Mudderoy,do you know if those gears are available from a local stealership?One more question.With the 31x10.50's on my Xj,how much difference in mileage calculation do you think mine is off?I still have the stock speedo gear in there as far as I know. That's where I bought my two. Thanks for posting the chart man! this clears up some of my question. thats awesome that you live so close to such a cool place! that would be trouble for me! i would never have any money! haha. Hey Mudderoy,do you know if those gears are available from a local stealership? Yeah you can order them through the stealership... thats where I picked up mine. Waiting for my gear to come in from Morris 4x4 Center. I must be brain damaged or something, but I don't understand what that chart is trying to tell me. Am I to assume that the baseline standard speed is 30 mph or what? I know that my speedo reads slower than I'm actually going, but I don't understand the chart. Do the descending numbers represent a part number? 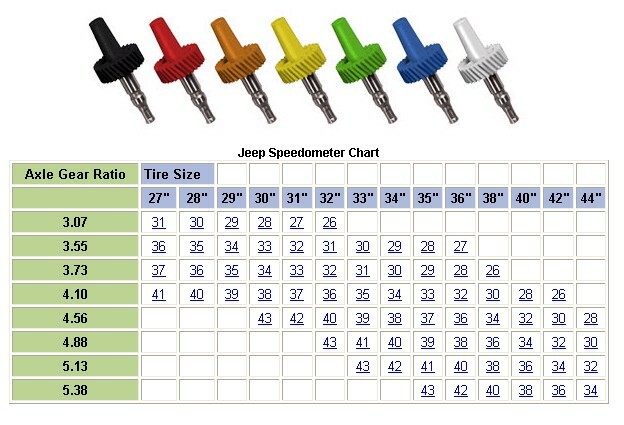 Like if you are running a 3.73 axle ratio and 33 inch tires you need a Number 31 speedo gear? Do they represent a speedometer reading? I don't understand. so would be speedo read to high or too low with bigger tires without new gear?